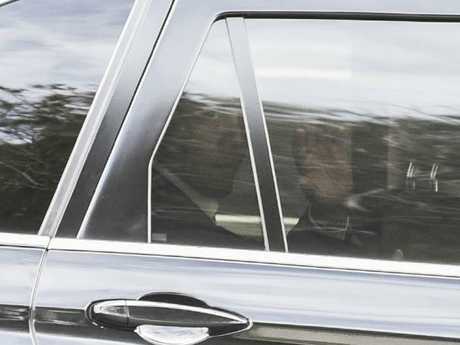 Former US president Barack Obama is seen inside a motorcade in Sydney, Friday, March 23, 2018. Picture: AAP Image/Danny Casey. FORMER US President Barack Obama said "fact, reason and logic is being tested around the world" at an exclusive private event at the Art Gallery of New South Wales. The former Democratic leader addressed a crowd of around 350 invited guests at the invitation-only event. Christine Forster tweeted from inside and said the former US leader said young people don't have any faith in existing institutions, calling for them to be empowered to drive change. Kelly Slessor, founder of Australian fashion app Shop You, was invited to the exclusive event and told news.com.au it was "incredible". She said Mr Obama spoke for about an hour on everything from Facebook and Microsoft to bin Laden, raising children and diversity. She said he stressed the importance of young people, who "drive change", and women in the workplace. No tickets were available to the address, but Ms Slessor said the crowd included a wide range of business people including Celebrity chef Matt Moran and City of Sydney councillor Linda Scott. The exclusive invitation for the private Obama talk. The evening was not open to media and was billed as "driving positive change". 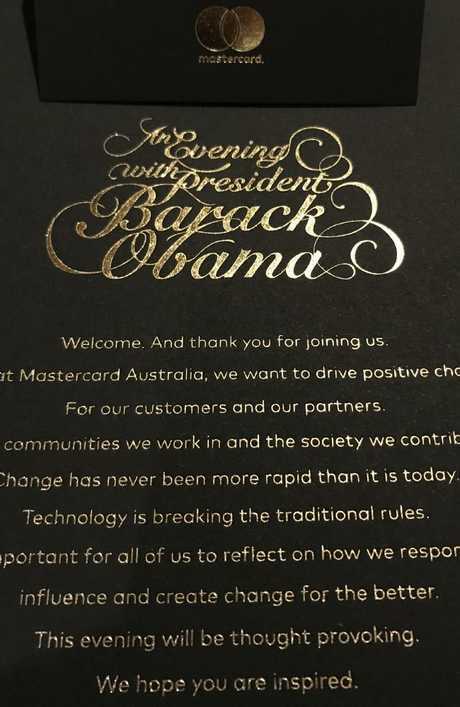 The black and gold invitation notes: "Change has never been more rapid than it is today. "Technology is breaking the traditional rules. It's important for all of us to reflect on how we respond to, influence and create change for the better," it stated. Earlier in the day, Mr Obama took a tour of the Sydney Opera House and was asked what he thought of the city. "Gorgeous, beautiful, love it," he said. 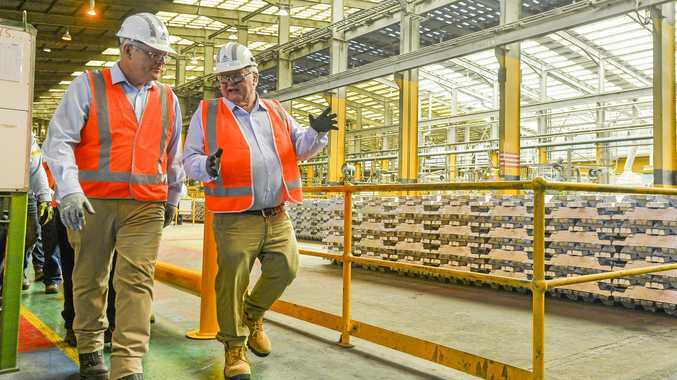 He also met with Prime Minister Malcolm Turnbull after arriving just after lunchtime, flying in from New Zealand after a visit with Prime Minister Jacinda Ardern and former leader John Key. 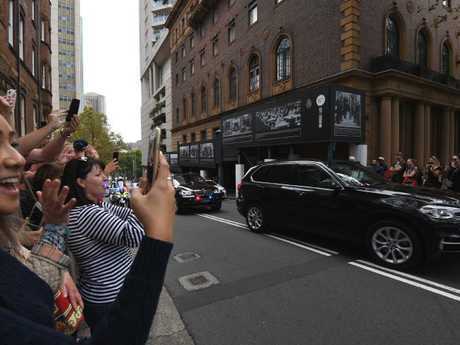 Police searches and securing of safe areas preceded Mr Obama's arrival at the airport, and a significant security details accompanied the former leader while he was driven to the Intercontinental Sydney hotel in the city's CBD. 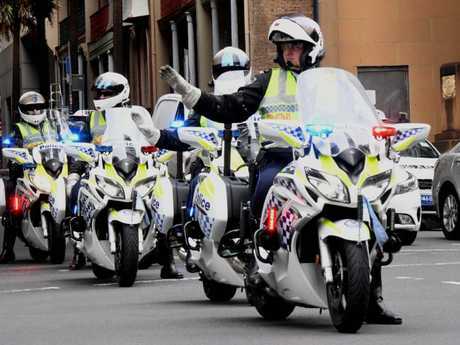 Traffic was halted as police officers cleared the road for the black BMW Mr Obama was travelling in. Prime Minister Malcolm Turnbull said on Thursday he was due to "catch up and have a chat" with the former president, who is on a week-long tour of Australia, NZ, Singapore and Japan. Just before 5pm Mr Turnbull shared a picture of the pair meeting in what appeared to be a hotel suite, accompanied with the caption: "Welcome back to Australia President @BarackObama." 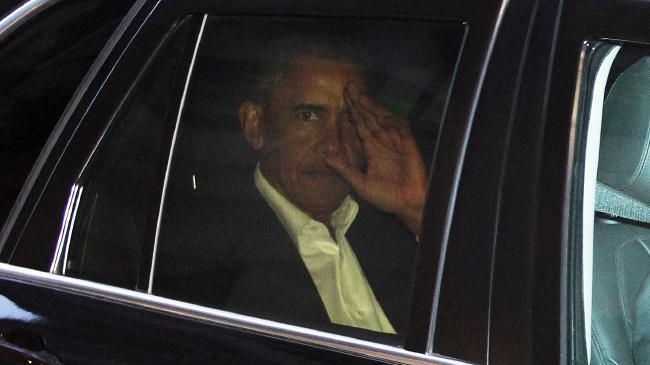 In New Zealand on Thursday night, Mr Obama addressed about 100 people at a private event after a formal welcome at a ceremony at Government House in Wellington. In New Zealand since Tuesday, Mr Obama also managed in a round of golf with Mr Key before holding candid talks with Ms Ardern, where he volunteered some tips on juggling the prime ministership with parenting. Ardern is expecting her first child in June, and when she asked Mr Obama how he dealt with the guilt of being a parent and a world leader, and his advice was: "do the best you can". Mr Key and Mr Obama have teed off together several times before, and played Kauri Cliffs gold course, a par 72 championship golf course ranked 39th in the world by Golf Digest. Mr Key said hosting the former US president would lead to tourism benefits. "He's still one of the most influential people on the planet," Mr Key told NZ radio. "From a New Zealand-US perspective [this is] really important, and from a tourism perspective the reality is there's 100 million people [who] follow him." 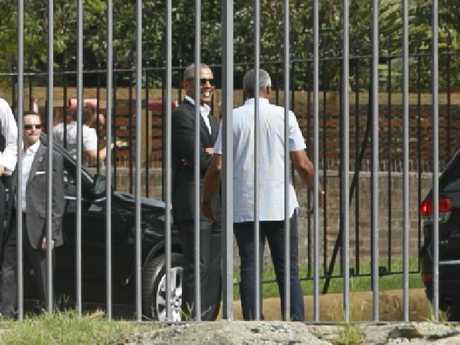 Actor Sam Neill hosted Mr Obama in Thursday night's private dinner. Mr Obama is on a week-long tour of Australia, New Zealand, Singapore and Japan, with Tokyo the next stop after Sydney.